After snow overnight on April 1st, the 2nd and 3rd were much, much milder than of late, albeit Monday 2nd, Easter Monday, was also extremely wet. Tuesday 3rd dawned similarly, but improved as the day went on, there were some showers of biblical proportions which I was out in, as you will see. Rain, hail, thunder and lightning, all very Terry Gilliam. But apart from that I had a good day chasing Tugs, three of which; 60040, 60091 and 60100 were out on oil trains from Robeston in West Wales. Wednesday was somewhat similar, more showers if anything but I enjoyed a brief dry and sunny interlude up at Bedlinog and Cwmbargoed around lunchtime. I spent the rest of the week nearer home on the Marches Line. The Margam to Dee Marsh ran on Thursday, Friday and Sunday; to Moreton on Lugg from Acton on Thursday and from Southall on Sunday; Chirk to Baglan Bay on Friday morning (still partly loaded??) and a daytime Dee Marsh to Margam on both Friday and Saturday. On Friday April 20th I spent a very productive day on the Berks and Hants alongside the Kennet and Avon Canal. All the stone trains ran as advertised between 11:00 and 18:00, with just one exception. I was in London on the 24th & 25th on non-railway matters but still managed a few pictures. The rest of the month was spent in and around home with a visit on Monday 30th to Onllwyn, when I saw that Freightliner's 4O10 from East Usk had been activated and was actually running. And so to May and a visit to Coalpit Heath and Old Sodbury before the catenary is strung. 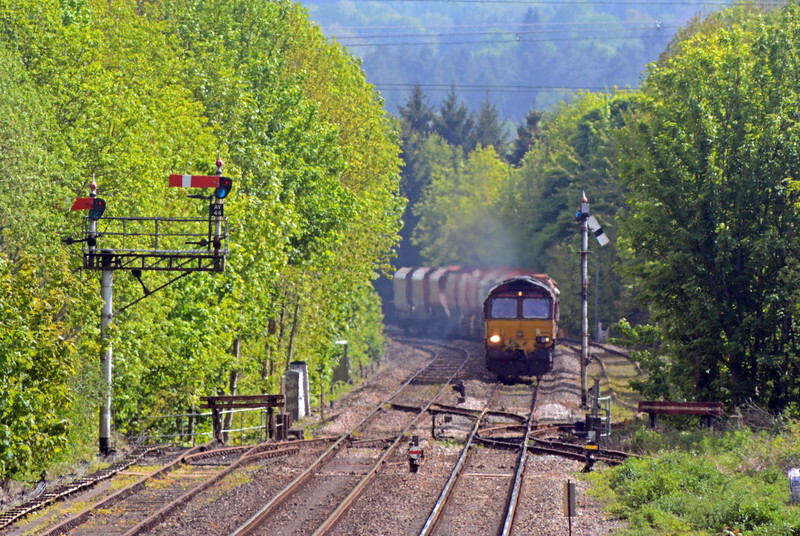 On the May Day bank holiday I spent a very enjoyable few hours along the Cambrian mainline around Commins Coch and Talerddig. The trains may be mundane but the Cambrian remains a scenic delight. Another trip to London on May 15th, returning the following day. On arrival at Paddington I took myself off to Headstone Lane and South Kenton, moving on to South Tottenham and Harringay Green Lanes in the early evening for the Gateway to Duisburg (and onward to China) intermodal. Today's 6B35 started at Didcot with 66014, having recessed there from Southall overnight. It was running a few minutes late on account of a tardy ATW DMU as it approached Abergavenny at 15:53.